From acclaimed director Michael Bay comes "Pain & Gain," a new action comedy starring Mark Wahlberg, Dwayne Johnson and Anthony Mackie. 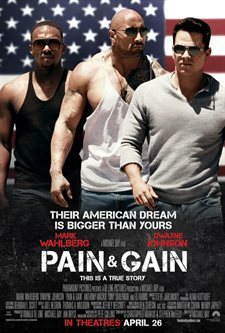 Based on the unbelievable true story of three personal trainers in 1990s Miami who, in pursuit of the American Dream, get caught up in a criminal enterprise that goes horribly wrong. Ed Harris, Tony Shalhoub, Rob Corddry, Rebel Wilson and Bar Paly also star. The film is based on magazine articles by Pete Collins, with a screenplay by Christopher Markus & Stephen McFeely and produced by Donald DeLine, Michael Bay and Ian Bryce. Download Pain & Gain in Digital HD from the iTunes store. Pain & Gain images are © Paramount Pictures. All Rights Reserved.